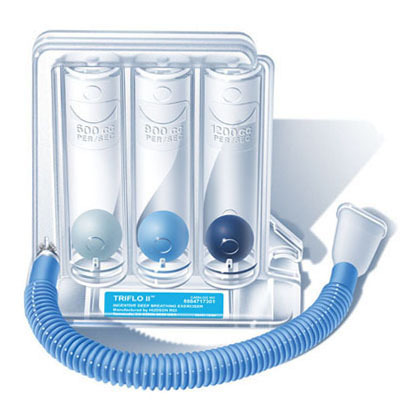 The TriFlo II Inspiratory Exerciser has a wide flow rate range from 600 to 1200 cc/sec. The TriFlo II has 3 color-coded balls and 3 chambers. The minimum flow is imprinted on each chamber. Incentive Spirometers are ideally used to promote slow sustained maximal inspiration (SMI). The Hudson TriFlo II helps the development, improvement, and maintenance of respiratory fitness. It is made of break resistant plastic. Latex Free. Tube and mouth piece included. One per package. Teleflex # 8884717301.